Summary WINTER SLEEP is a Turkish drama about a retired actor and owner of a mountaintop hotel, who begins to reassess his life and values through a series of conversations with those around him. 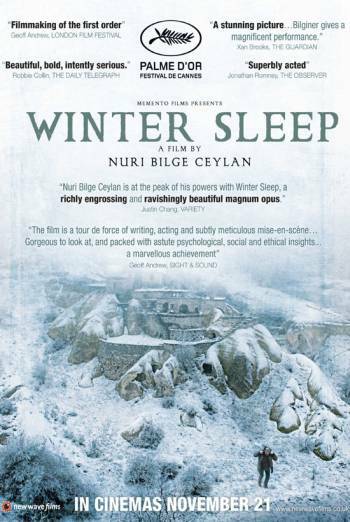 WINTER SLEEP is a Turkish drama about a retired actor and owner of a mountaintop hotel, who is forced to reassess his life and values after a series of conversations with those around him. There is occasional use of strong language ('f**k'), the majority of which occur within a single argument between four men. There is a sequence in which a wild horse is chased and subsequently pulled out of a river. The horse appears exhausted but there is no evidence it was harmed or injured. In another scene, a man approaches a rabbit he has shot during a hunting expedition. Although the rabbit is still alive, there is no evidence the rabbit was mistreated.